The word occult comes from Latin occultus (hidden), referring to supposed secret or hidden knowledge usually of the supernatural. Sometimes the knowledge does not consist of access to particular facts, but is arrived through the mind being taken through a process triggered by a text, image or performance. See occultism. Many (especially conservative Christians) use it to refer many practices which they disapprove of but which those who participate in it do not consider occult (Dungeons & Dragons, heavy metal music, even sometimes Catholicism!). Even for those who do consider what they are doing occult (e.g. ceremonial magicians, Satanists, etc. ), their beliefs and practices are normally far from being secret or hidden, being found very easily (in books or on the Internet). J.W. von Goethe, Faust, part II finished. Goethe dies. The Fox Sisters contact spirits through rapping; Spiritism Craze begins in Hydesville, N.Y. 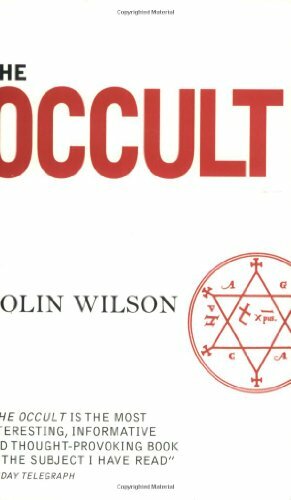 Featuring a new introduction by the author, Occult is a powerful synthesis of available material. Colin Wilson utilizes a wide-ranging survey of paranormal experience to explain his own theory of the sixth sense, showing how it is at the center of all occult phenomenon and offering an insightful exploration of humanity's latent powers. Written with a refreshingly optimistic and stimulating interpretation, Occult is a journey of enlightenment. But there was, equally, a positive side to Crowley. This emerges in Seabrook's account of Elizabeth Fox's experience at Thelema. She was the "film star" who somehow avoided becoming Crowley's mistress. Seabrook says that before she came to Cefalu she was in a depressed condition due to too much night life and bath-tub gin. Crowley dismayed her by telling her that she must begin with a month's solitary meditation in a lean-to shelter on the cliff-top. When she objected, he pointed out that there was a boat leaving the next day. To comply, she had to meditate naked, except for a wooly burnoose that could be utilized on chilly days. The shelter was completely empty; the latrine was a lime pit outside the "tent." "She would have, said Master Therion, the sun, moon, stars, sky, sea, the universe to read and play with." At night, a child would quietly deposit a loaf of bread, bunch of grapes and a pitcher of water beside her. She decided to give it a try. The first days confirmed her fears. Sun, moon and sea are all very well, but if you feel bored, they are boring. For the first days she felt nervous and resentful. By the nineteenth day, her chief sensation was boredom. And then, quite suddenly, she began to feel "perfect calm, deep joy, renewal of strength and courage." There is nothing strange in all this, although few people know it. The mind must be made to stop running like a wristwatch. It must be persuaded to relax and sit still. Its hidden fountain of strength must be persuaded to flow. This is the secret of the Hindu ascetics who sit still for years. It is not penance, but a continuous trickle of deep delight. What is more, this is an automatic process. Our subconscious robot will adjust to any conditions if it is given long enough. It adjusts to stillness, so that the stillness ceases to cause boredom. For you have boredom when nothing is happening inside you. And nothing is happening inside you when the outside world keeps the mind distracted. If the outside world is distracted for long enough, the inner power-house begins to work.